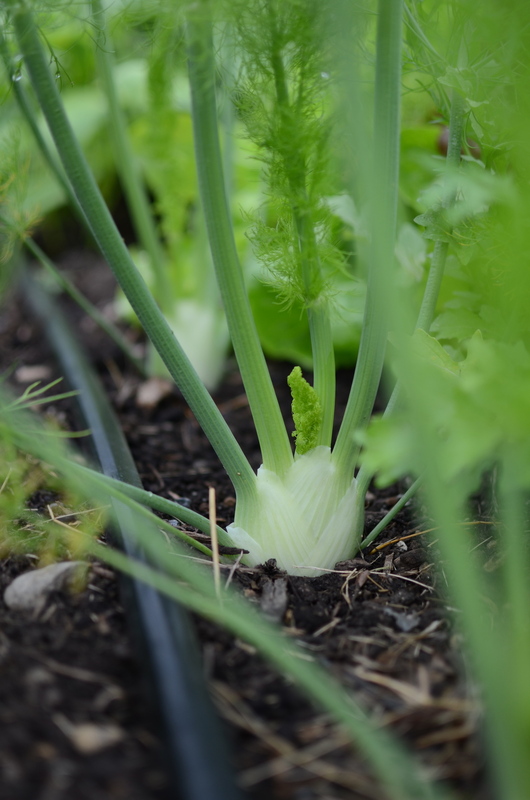 Annual fennel, Foeniculum vulgare, also know as “bulb” fennel, is a versatile vegetables that makes a great addition to soups, salads, pizza’s and has even been know to make an appearance in desserts (Fennel cupcakes)! It’s high in vitamin C, and is also a good source of calcium, fiber and potassium. In the Seattle-area, we can usually grow fennel all summer long, but for those growing in warmer climates plant it early to mid-spring for an early summer harvest. Fennel can be direct seeded or transplanted into the garden. To direct seed, sow plants ¼- ½” deep, and thin to 6-8” apart. Harvest “bulbs” 3-4” diameter. The crunchy white “bulb” that you eat consists of the swollen stem bases of the leaves. Once harvested, cut off the stalks and store “bulbs” in a plastic bag in the refrigerator. Perennial fennel is a beautiful, tall herb that will add a soft, feathery texture to your garden and attract beneficial insects. This type of fennel is a good source of seeds and fronds that are great for seasoning. Perennial fennel is very hardy. It's root spread aggressively and can fill your garden with unwanted volunteer plants. It is considered an invasive weed in some areas so plant with care! We have found that perennial fennel doesn't grow well in containers, but do plant it someplace where it's spreading nature won't consume other plants or it's tall fronds won't shade them out!